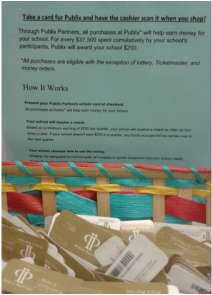 Publix – Hand the cashier your Publix Partners in Education card – the school gets a % of qualifying purchases and a check is sent to the school once the balance in the account reaches $250.00. These cards are available in the front office. Feel free to pick several up and give to your friends and family!